Yesterday - Feb. 28th, was my daughter's 12th Birthday. She was born on a leap year, and missed that when she was born by one day. Saturday she had a party with some friends from school. Hey guys, I have a really exciting review and giveaway for you. I was recently sent a cool product to test and review. And now I will be able to give one lucky reader one too. The product is called Robby Wash Ball. And it is can be purchased on the Oransi website. None of the hassles that you have with traditional laundry detergent such as lugging it through the store, cleaning up spilled detergent, etc. When I first heard about the Robby Wash ball I was really intrigued and curious as to how this would work. I received my package in the mail. And read up on how to use this. Which basically is very simple. Just toss it in your washer, with your clothes and wash. According to their website the Robby Wash Ball will last up to 1 yr. (or 120 consecutive washes) . When you need to refill the Robby Wash ball simply open the tab on the ball to refill with the macro molecule pellets, when they are less then 75% full. The first thing I tried washing was my ultra favorite blanket. I washed it with the Robby Wash Ball. I really noticed how soft it was afterwards! Awesome! I am really loving this product. And my husband - who was very skeptical at first because he is really picky on his laundry - even said it is working great ! With two kids - of course they get stains on their clothes - and I have also really been enjoying the free stain remover stick too. Win it! One lucky reader will win their own Robby Wash Ball ($32.95). Which the pack includes the blue washing ball, a stain stick and three extra packets of macro-molecule pellets. I recently was sent some nail art stickers to review. Onlinenailbar.com stock a fantastic range of nail art stickers. Each sheet contains between 30 and 60+ stickers so this means that you can complete mutliple manicures or share with friends. This product is extremely affordable at only £1.25 each. Nail art stickers are easy to use and create a professional looking manicure which ends up costing pennies. I found out that these stickers are cost £1.25 GBP which means (approximately $1.98 USD) per sheet. So that is a great price! Also - . All items are giftwrapped and placed in organza bags prior to being shipped. I am no expert at doing my nails or applying nail stickers. (or taking shots of my hands.) So forgive the following pictures. But I had fun trying out these nail art stickers & I think with a little pracitce I could get better at it. And these were very easy to apply so I may give it another try & I really think I could get the hang of it. And I just love the design & colors on these! Lots of possibilities. Check out nail art stickers yourself on this link: nail art stickers and purchase some for yourself. We had our first snow storm since moving to Virginia. Melted pretty quickly. 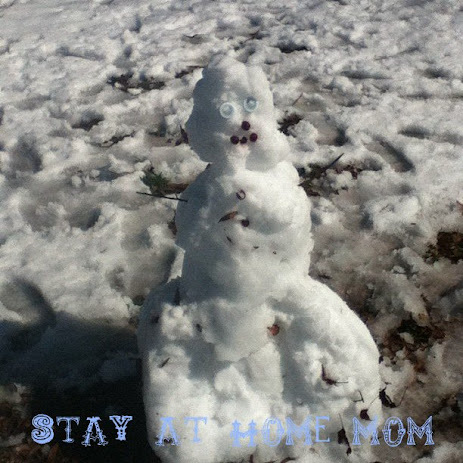 This little snowman was gone by the end of the day. Hi everyone, I want to let you know about my recent smiley360 mission. I received a 50 oz. bottle of Woolite Complete. I remember Woolite from when I was a kid. It used to be just for "Delicates." But now Woolite can be used for all your clothes. It's great for all colors and fabrics. Woolite Complete is the detergent to use for all of your wash-loads and in all washing-cycles. It cleans and cares for your clothes, keeping them looking and feeling like new. CLICK HERE to get a $2.00 coupon off your next purchase of Woolite Complete. Not a smiley360 member yet? Join smiley360 now to qualify for cool missions like this one. Disclosure : I received a free sample of the above product through Smiley360. All opinions are my own. Zenni Optical - Great Promotion! Hey guys, I want to tell you about a "crazy" promotion that is going on. It is going on right now at Zenni Optical. Would you like to hear more information about this promotion? Especially the part where you can get $6.95 prescription eyeglasses? Well please read on if you would like to know more. Right now Zenni Optical is having a promotion - buy 2 pairs of eyeglasses - and get the third one free (of equal or lesser value.) Wow! Doesn't that sound like a great deal? This is really an awesome promotion. Hurry and check it out soon. Because this is for a limited time only. This is the biggest promotion in Zenni's history! Virtually any kind of glasses can be ordered on Zenni Optical. You can get bifocals or even progressive eyeglasses on their website! If you want tint you can order that for $4.95. There are so many options at Zenni that you can switch up your styles to match your outfit or mood. At these prices you can't go wrong! You can even use the frame fit tool and try any frame before you buy them. You upload your picture and then you can put different frames on your face to test them out. Cool! So check out Zenni Optical for this great promotion going on now! This is a cake my daughter and I made for Valentine's Day. It is a strawberry cake - with pink vanilla funfetti frosting, shaped like a HEART! Hope you all had a nice Valentine's Day! Hi everyone. Hope you are having a great day. I want to tell you about a product I received through my smiley360 account. I got a sample of Knorr Homestyle Stock. I decided to add it to some plain white rice. This makes a great side dish. And is so simple. That seems to be the great thing about this Knorr Homestyle stock. It can be added to so many different recipes. There is chicken flavor or beef flavor. I received the chicken one. And I am excited to not only try this in rice, Iike I just did, but soup, or I saw a lemon chicken recipe that it could be added to that looked awesome! Check out more recipes by following them on Facebook. if you would like to get missions like this - that gives you free samples - join smiley360! Hi friends! I would like to let you all know about clipix. First I think you should watch the video below. It will give you all a better idea about what this is about. I just signed up for an account. And it was really easy. I signed up through Twitter. You can also use Facebook or your email. This is gonna be great to save stuff on. Ever look online and see stuff - and then you wish you had a way to save it. But you never do. Then when you want to remember it again. You have to search all over again. Like I was just in the book store yesterday and I saw tons of books I would like to read. I now just searched online for some of these books and I just clipped them onto clipix. This way I will be able to remember all these great books I was thinking of. I really encourage you my friends to go check this site out and sign up for yourselves. What would you use clipix for. Some examples are gift ideas, restaurants, movies you want to see. What can you think of? Please go now and sign up for this awesome site. And let me know in the comments what you think would be a good use for it! This is a Sponsored post written by me on behalf of dealnews for SocialSpark. All opinions are 100% mine. Hey readers! I want to let you know about a really cool website. I learned about this site. And it is called dealnews. Do you ever wish that you could find the same kind of deals you do say like on Black Friday? Well now with this website you can - it is like everyday is Black Friday. This site gets tens of thousands of deals everyday. They look at over 2,000 retailers to bring you the best deals. These deals are ones that you would normally only see on Black Friday. They also verify all the deals to make sure it is valid. And they lowest prices from reputable dealers - so don't worry! I really encourage you guys to check this site out for yourselves! I was searching for some laptop deals. 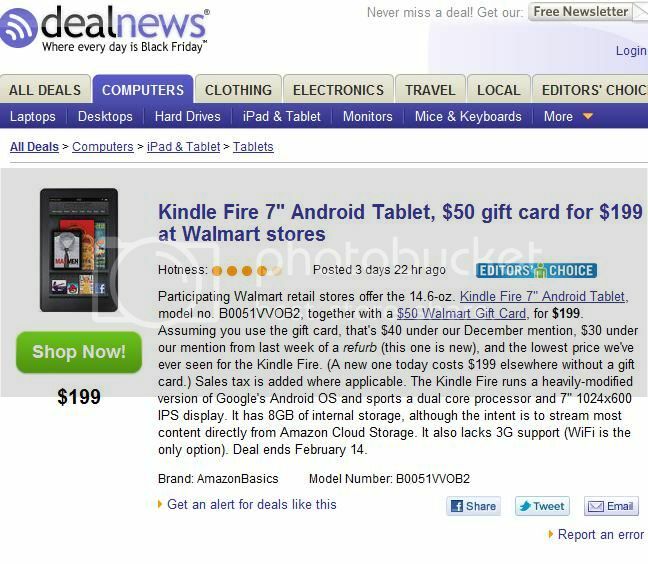 And I came across this deal on a Kindle Fire. I remember my daughter wanted one of these. And her birthday is coming up. I will check dealnews some more and see if I could get a deal on this for her birthday! If you never want to miss another deal on a specific product - such as clothing, television, etc. Or even from a specific store. Then check out this site. You can even set up email alerts! And also get their Select Newsletter - check it out! What deal did you find on the site? What would you buy. Please let me know in the comments. Please read this important information! I want to let you guys know this right away because it is for a limited time. Sprint is having a sale. And it is going on right now! So you have to act quickly. OK? I want to let you guys know this info. as soon as possible. The sale is from 2/5 through 2/8. It is a 4 - Day Sale! And this sounds like a really good deal that is going on. This is an awesome sale going on right now! Hurry and check it out! Also get waived activation fee for new lines of service & free shipping on sprint.com. Hey guys! I have some really great news for you. It is about Walgreens. I learned some important information about them. I would really like to pass this onto you guys, since it really seems like a great deal. Please read on for further information. The Walgreens Prescription Savings Club is having a special discount right now. They are having a $35 a year family membership. This will include everyone in your family. That is your immediate family, which includes your spouse, dependents that are 22 years old and younger. It will even include your pets! There is also a discount for individuals too. Individuals can join right now for $20. Check this out to join! This is a really great savings for families and individuals. If you join you will receive discount prices on your prescriptions. I found out about some other benefits to the savings club also. I would like to share some of these with you. I have learned that there are savings on more than 8,000 brand-name and all generic medications. You can also receive discounts on flu shots. You can even get discounts on pet prescriptions, nebulizers and diabetic supplies. There are even bonuses for purchases of Walgreens brand products and the photofinishing services. Please connect with Walgreens and find them by joining them here: Walgreens on Twitter & Walgreens on Facebook. I would like to give you some information about a product I recently learned about. Have you heard of the Lenovo? Well now there is an upgrade to the popular Lenovo Enhanced Multimedia Remote with Keyboard. One thing I know after watching this video is that my son would love to have one of these! They took people's feedback and made a lot of improvements to the Lenovo's Remote. This will give you more function and fun now. This would be great to control your PC, xbox, etc. One feature that really is an upgrade form the previous model is the backlit keyboard. It will really light up in the dark. I know when my son is doing something on his PC or PS3 he usually is doing it in his dark room. So to have this backlit keyboard would really help. If I had a chance to use one I really would be excited about that feature! A few other things I wanted you to know - is there are no drivers to install. You just simply plug in the "nano dongle" USB and you are ready to go. And it has a great frequency too. So you can use it as far as 30 feet away! This looks so cool! Hey guys. Have you heard of Smiley360? Well I recently joined and have been receiving some free products. Go check it out and join up. It's free and you just fill out some information and then you may qualify for missions. Then they will send you the products and all you have to do is share on social media. Like your blog, Facebook or Twitter. One recent product I got was some Children's Advil. CLICK HERE to receive $1.00 off coupon. I love Children's Advil and this will definitely come in handy if one of the kids needs it. Disclosure : I received a free sample of the above product through Smiley360. All opinions are my own. Read all product information before using. Hey everyone. I was just visiting a really cool website and I wanted to share it with you all. Please visit www.digdropdone.com to learn more for yourself too. But I will try to let you know what I learned there myself. I am afraid I am not much of a gardener. Even though it should be in my genes. My grandmother and all the other woman in my family seem to be though. I should have inherited it or something. But I was looking at the website Dig Drop Done and really got inspired by the use of bulbs. Doesn't this picture below look like a cool idea? This looks like it would make a great Spring centerpiece. So festive. You can get a lot of other ideas there as well. There is also some ladies to help you out too. The Dig Drop Done ladies will help you to expand your knowledge and enjoyment out of bulbs. I related to Marcy - the Super Mom, because she has a busy family life, but finds bulbs a simple and easy way to bring some beauty to her life. There is also a cool contest going on "Bulbs. Dig, Drop, Done" Enter a picture of your yard at Curbside Chaos and you could win a $5,000 yard makeover! Also for every Tweet shared on Bulbs. Dig, Drop, Done - they will donate $1.00 to Rebuilding Together. Lastly I want to tell you about the Garden Guru tool. It will tell you depending on your location what kind of bulbs would be good for you. This is one they suggested for me. Aren't these lovely? I'm ready to start planting! This is what an individual pan pizza looks like after it has been cooking for 4 hrs. And when you wake up at 6 am on a Sunday and find out that your 15 yr old son has left the oven on and the pizza is burning away in the oven. He has since been restricted to cooking - at least to when I am awake to know if the pizza is burning.